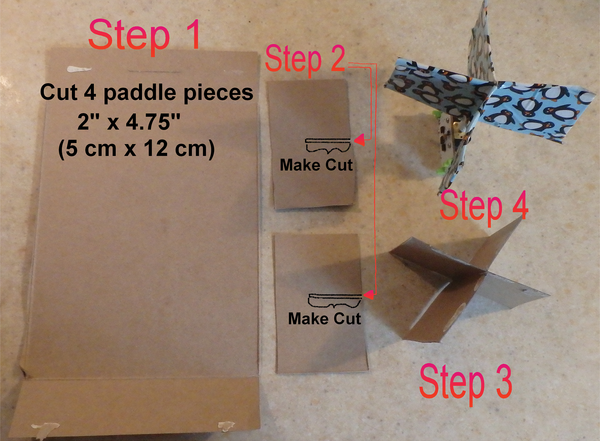 The first step is to cut four rectangles out of thin cardboard (from cereal or cracker boxes). For our design, we used paddles that were 2x4.75 inches (5x12cm). We cut slits half way in each paddle blade, so that the two pieces would fit together (Figure 1). Next, we put the paddles into the littleBits DC Motor bit with the slotted motorMate attachment and covered them in duct tape. You need to make sure the cardboard is completely covered or it will get wet and break down. 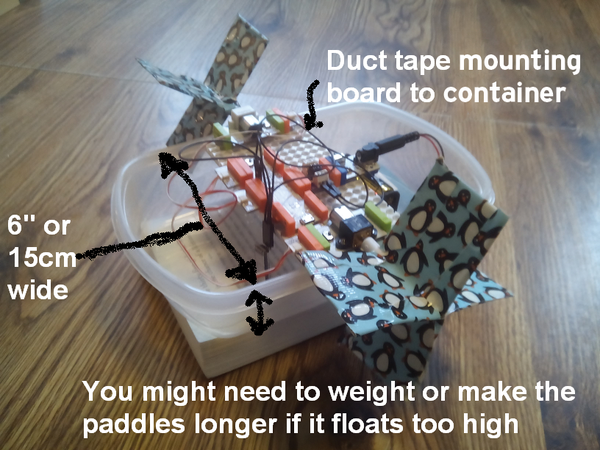 For the boat, we used a plastic container 6 inches (15cm) wide in which to fit the littleBits mounting plate (Figure 2). Duct tape on the bottom and sides of the littleBits mounting plate secured it to the plastic container. 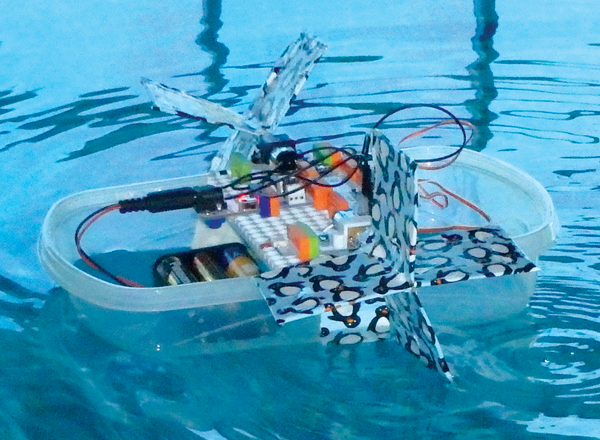 We found that our boat floated a little higher in the water than we wanted, so we added some weight by using 6 AA batteries for power (Figure 3). Figure 2: The plastic container and mounting. 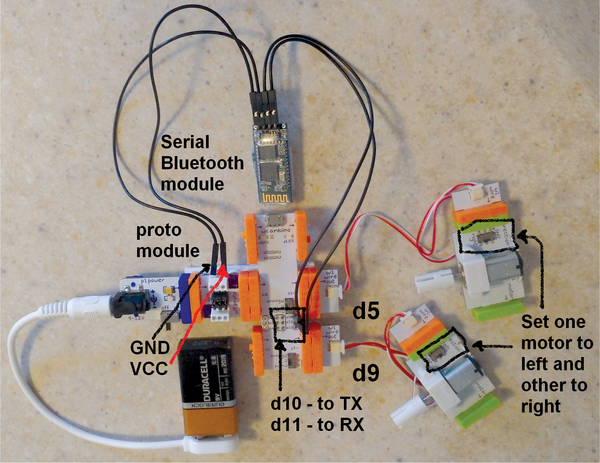 A JY-MCU Bluetooth serial module handles communications between the littleBits hardware and an Android phone. Arduino Bluetooth communications typically take place on ports 0 and 1 (d0 and d1); however, we chose to use ports 10 and 11, because that required one less littleBits Proto module. (d0 and d1 each have their own snap bit at one end of the Arduino module, whereas d10 and d11 are pins that can be connected to the serial module via jumper wires.) This configuration left the default port (d0 and d1) free for debugging. The Bluetooth module received power through the littleBits Proto module. If you don't have a Proto module, you could use an external 3V battery. The littleBits DC Motors were wired on pins d5 and d9. These DC motors have a direction toggle. For the paddles to spin in the same direction, it is important to set one of the motor's direction toggles to left and the other to right (Figure 4).